The inaugural event was launched in St. Louis on the tailend of the 2017 Sinquefield Cup won by Maxime Vachier-Lagrave. 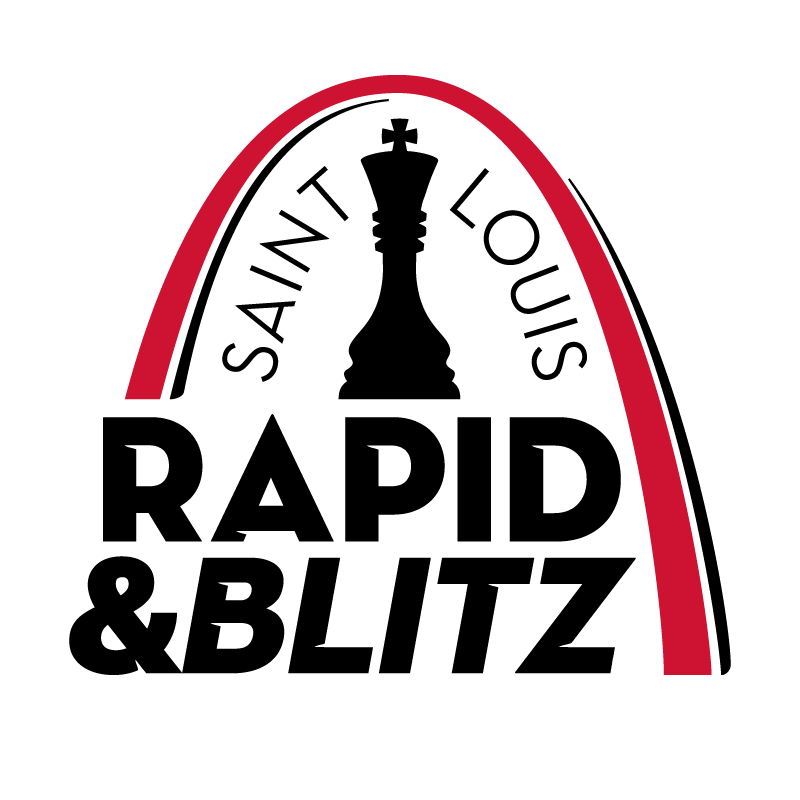 It is hard to top such a strong field, but the intrigue was heightened when the 13th World Champion decided to play in the St. Louis Rapid & Blitz of the Grand Chess Tour. While he contends that his days of competitive chess are over, he dove headfirst into a field of elite players. Levon Aronian won the event in fine style with Sergey Karjakin and Hikaru Nakamura coming in second. After the event, The Chess Drum was able to get several interviews after the event was over. The legendary Yasser Seirawan was graciously enough to grant a very lengthy interview on a variety of topics. GM Levon Aronian (Armenia) – Sometimes it’s best to get interview while players have a full perspective of their play. Aronian talked about his victory, Kasparov’s addition, his ambitions for the World Championship and his love for bughouse! It was the 3rd time that the Armenian has spoken to The Chess Drum audience and it is usually under victorious circumstances (2008 and 2012). Interviewing Levon Aronian after the closing ceremonies. 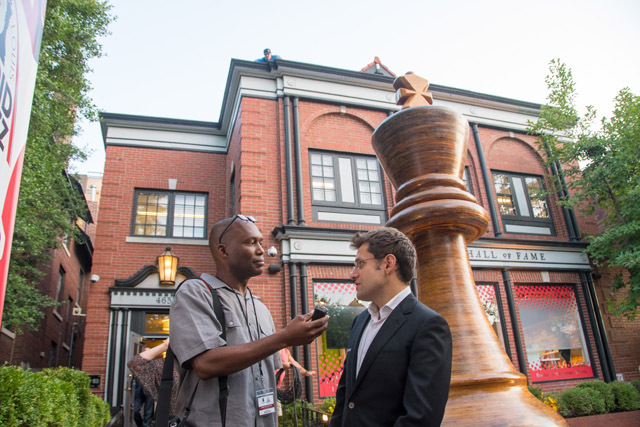 I was able to see Aronian play bughouse at the “chess house” and it is amazing the type of tactical patterns. When asked with this practical experience was helpful for tournament play, he had a very measured answer. The interview is short, but as usual Aronian leaves us with his usual cheerful persona! GM Leinier Dominiguez (Cuba) – Cuba has a vibrant chess culture and it is very much a part of the national landscape. Everywhere you go, you see chess on the streets, in murals, in sculptures and even lessons on television. I was able to see this on my trip to Cuba back in 2011. In the latest Chess Life, Jacob Chudnovsky wrote and extensive article on the chess climate in Cuba. He mentioned that many of the top players got started at the Latin American Superior Insituation of Chess (ISLA) in Havana. 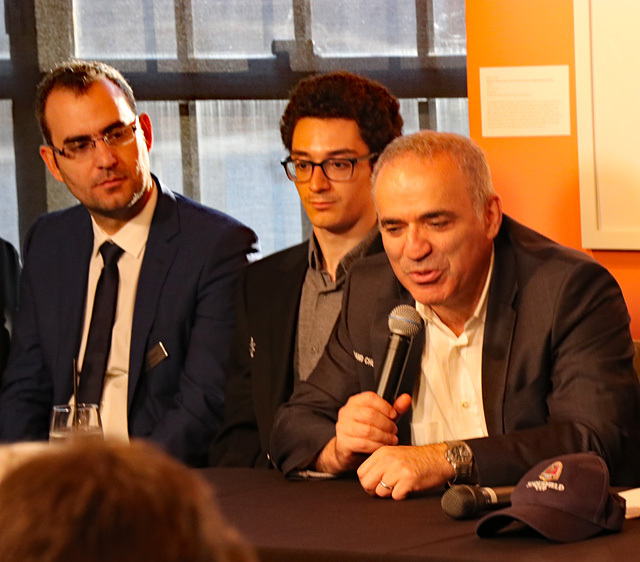 Leinier Dominguez and Fabiano Caruana listening to Garry Kasparov. Dominguez gave a short interview to The Chess Drum and talked about his experience at the tournament and his trip to St. Louis, his third. Surprisingly, Dominguez will not compete in the World Chess Cup and said he will go on a sabbatical for several months. According to some reports, the Cuban maestro has requested a rest from the Cuban national team. There are some rumors circulating, but there was no indication that his hiatus is nothing but temporary. GM Elshan Moradiabadi (USA) – Several years ago Moradiabadi was playing for the Iranian national team behind Eshan Ghaem Maghami. However, at age 16 he won the 2001 Iranian Chess Championship with +9 (10/11) ahead of Maghami. Elshan then went to the US to pursue studies after graduating from the prestigious Sharif University of Technology with e B.Sc degree in Chemical Engineering. Since then a couple of young players have emerged with Parham Maghsoodloo (17), now the country’s top player, and Pouya Idani (22) have taken over the baton. In Febuary, Moradiabadi changed his federation to the USA after earning two advanced degrees at Texas Tech University in Lubbock, Texas. He was originally recruited to the program by Susan Polgar, but when the SPICE program moved to Webster, he decided to stay because Webster did not have an engineering program. 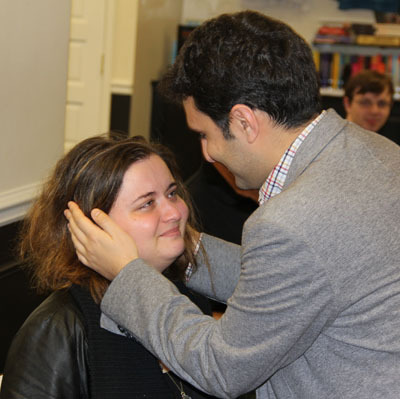 Fast forward, he served as Grandmaster-in-Residence at the St. Louis Chess Club at the time his fiancee Sabina Foisor won the title in an emotional triumph. Both are looking to start a new chapter in his life in the Raleigh-Durham area where they will be involved with teaching locally. He gave a brief interview to The Chess Drum and recounted his experiences in the US. Taurus Bailey chatting with Maurice Ashley. Taurus Bailey (USA) – Although a good percentage of the world follows every professional event on the elite circuit, it is a given that most chess players in the world are casual players with other professional lives. 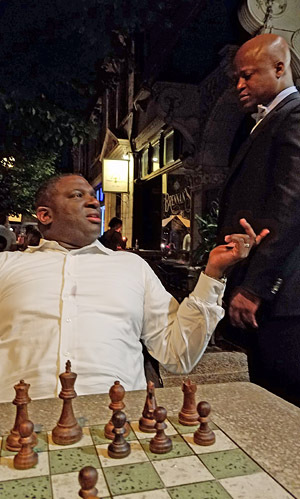 Bailey was in St. Louis to see the return of Garry Kasparov, but it should be known that he is also the manager of Maurice Ashley. As one can imagine, this would be a very demanding job as Ashley is a highly sought after commentator and speaker. The two met in social media after Bailey offered convincing arguments about Millionaire Chess catching the attention of Amy Lee and Maurice. He then provided consultation to the company on legal matters. A chess hobbyist, he practices civil law in a private practice. The Chess Drum also got an interview with Hall of Famer Yasser Seirawan who had many things to say about the Grand Chess Tour, Kasparov’s appearance, the U.S. chess scene and many other topics. We will have a special segment for this interview. Stay tuned!